In this section, you can learn about the structure and functionality of the page templates. 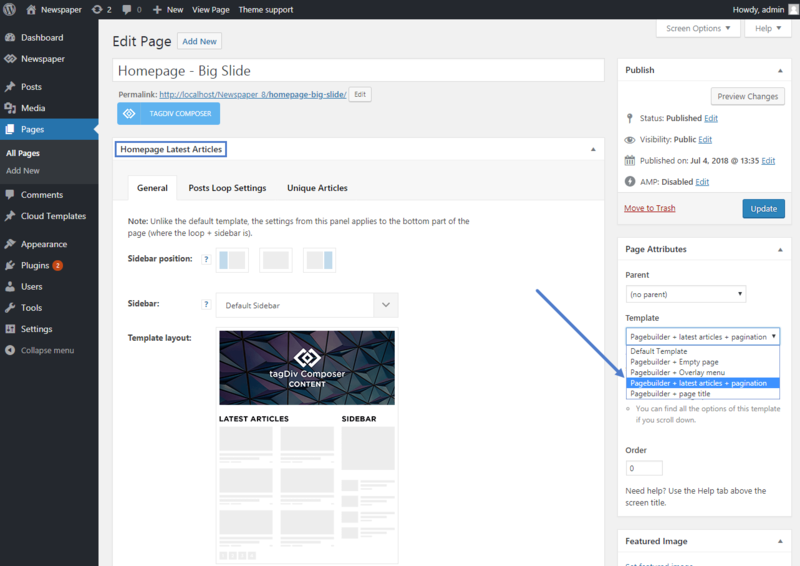 When you create a new page the theme automatically sets it to use the default template. This is the most flexible template because it doesn’t come with any predefined element. 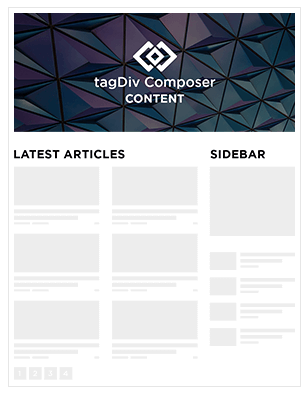 You use the tagDiv Composer to define the structure and the page elements. The overlay menu is used to create stunning pages that show the menu on top of the content using a transparent background creating a seamless experience. This only affects the main menu. The rest of the page is handled exactly like the default page template. 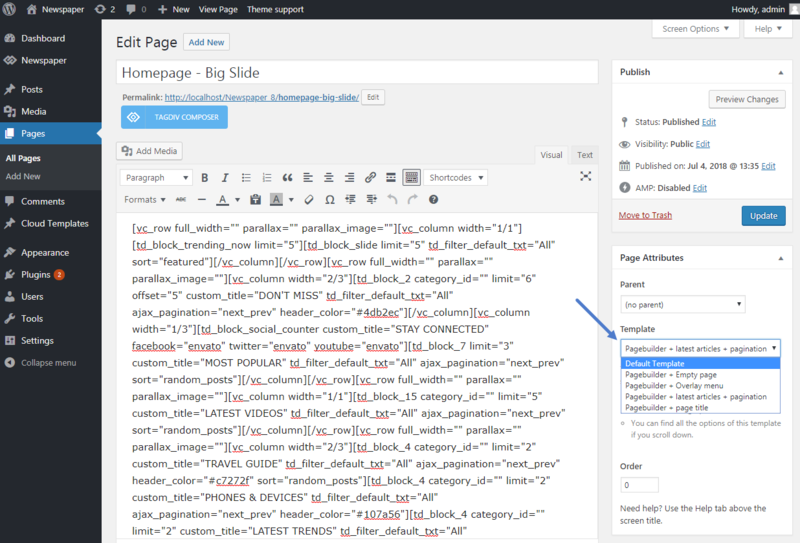 This template automatically brings the Latest Articles section and places it after the MCE editor content area. This section can be configured from the “Homepage latest articles” panel which appears on the left. The options are similar to the ones present on blocks and it comes with numeric pagination. Category filter – A single category filter. If you want to filter multiple categories, use the ‘Multiple categories filter’ and leave this to default. Filter by tag slug – To filter multiple tag slugs, enter here the tag slugs separated by commas (ex: tag1,tag2,tag3). 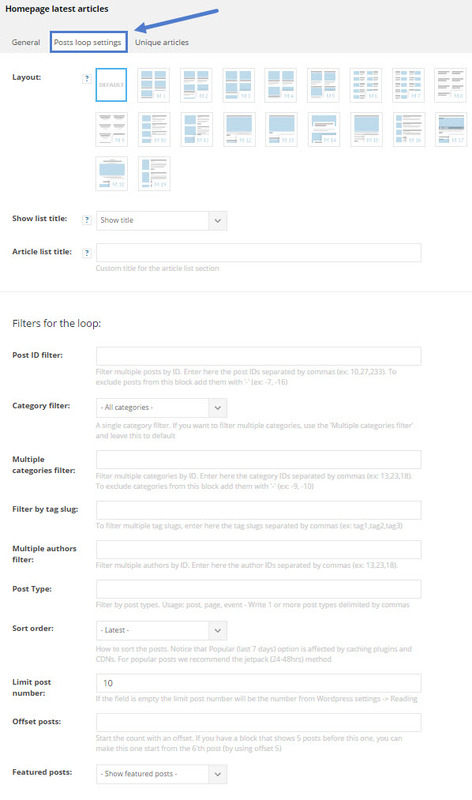 Multiple authors filter – Filter multiple authors by ID. Enter here the author IDs separated by commas (ex: 13,23,18). Post Type – Filter by post types. Usage: post, page, event – Write 1 or more post types delimited by commas. Sort order – How to sort the posts. Limit post number – If the field is empty the limit post number will be the number from WordPress settings -> Reading. Offset posts – Start the count with an offset. If you have a block before this one that shows 5 posts, you can make this precise one start from the 6’th post (by using offset 5). Featured posts – Option to show or hide the featured posts (posts which are included in the “Featured” category). It’s similar to the default template but it automatically adds the page title on top of the MCE editor content area.